Do nachos and Vienna, Austria — or for that matter, any city in Europe — really make sense? While visiting Vienna we came upon a wonderful outdoor film and food festival. The square in front of city hall was filled with every kind of food stall including Indonesian, Indian, Slovakian, Mexican, German, French, Australian, Cuban, Spanish, Italian, Iranian, and lots of beer and wine stalls. The place was packed and a giant screen was in front of city hall for the evening film. The atmosphere was festive, and fun; the aromas were intoxicating. The Mexican booth smelled wonderful and the line was long, so we went for it. Nachos with queso and guacamole. In the five minutes we waited no one else ordered this dish, but the burritos wafting past looked delish. 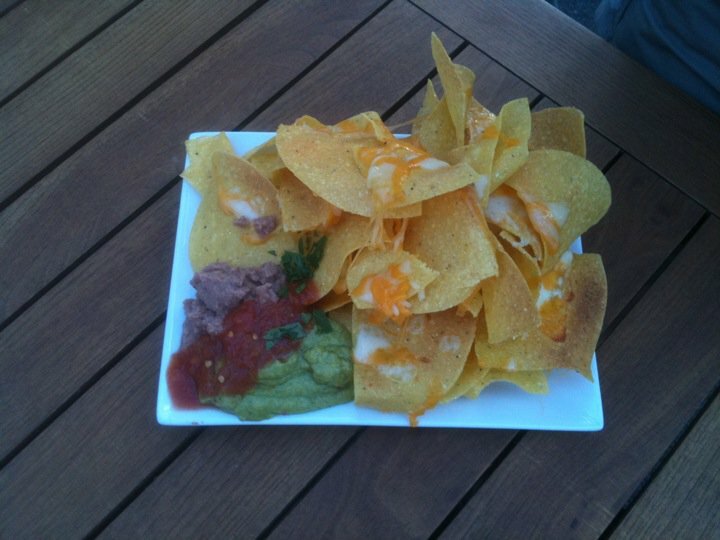 Appearance: Our nachos were a study in Austrian culture- order trumps creativity. The portion was euro- sized, filling a plate about 5×10″ with maybe four layers of chips. There were no toppings but rather “sidings”. Quality of Ingredients: Cheese seemed to be a combo of some white and orange cheese and tasted like Monterey Jack & cheddar. The salsa was a study in mediocrity and seemed to have been pureed into submission- are chunks of fresh tomatoes too disorderly? On the whole, adequately forgettable. Distribution of Toppings: The cheese was not on every layer but mostly on top, and seemed to have been melted under a broiler. Refried beans, salsa and guacamole were neatly layered on the side for us to dip into with our chips. Overall, this worked very well. Price: 5.9 euros, around $8. For Austria, about standard. Given the other food at this booth, they really should be trying harder to make their nachos stand out. Missing ingredients that would have made them “ausgezeignet” were olives, peppers and a freshly-made salsa with fresh tomatoes. Austrians are masters of sausage and little pieces of a chorizo-types sausage would have really upped the ante!